Liberian President Ellen Johnson Sirleaf has called on community leaders in Montserrado County to serve as anti-Ebola ambassadors as a way of eradicating the virus. Most of the cases of Ebola in Liberia have been found in Montserrado, the country’s biggest county where the capital Monrovia is situated. 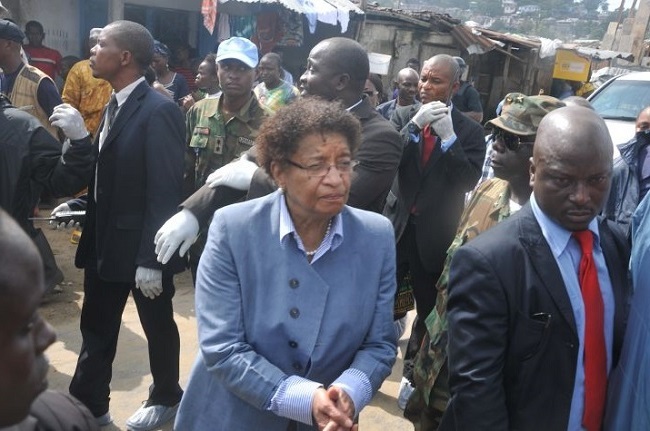 President Sirleaf said as community leaders, they should play an important role in this national fight by sensitizing residents of their communities about the danger of the virus and how they can prevent it from spreading. The Liberian leader made the statement at the end of a week-long Ebola awareness training workshop for 100 community leaders organized by the Liberia chapter of the Alpha Fa Alpha Fraternity at the Newport Junior High School in Monrovia over the weekend. She admonished them to pass on the knowledge acquired to their colleagues in their various communities so as to make the fight against Ebola a very easy one. She also urged community leaders at the workshop to work with authorities of the Monrovia City Cooperation (MCC) and the Environmental Protection Agency (EPA) to clean their environment while combating the Ebola virus.